Mane Support, Blount County’s and Tennessee’s only free-standing grief counseling center, has received a wonderful gift just in time for Christmas. That gift comes in the form of new fencing, additional horses and funding that will put this equine-assisted center on the path to reaching more clients right here and the opportunity to branch out much further. Dr. Eric Barton, founder, president and CEO of Maryville-based Vanquish Worldwide and owner of LexLin Gypsy Ranch in Rockwood, is donating 14 gypsy vanner horses to Mane Support. Ten of those horses will be sold beginning at midnight on Christmas Eve. The money from the sale will be donated to Mane Support. Barton will also provide $30,000 worth of fencing so Mane Support’s two pastures can become five. That will give this ministry more work space for its grief counseling and also leadership training. Kim Henry, Mane Support’s CEO and founder, is ready with her new campaign, The Power of the Post. She said the need is for 500 posts in order to complete the fencing of the pastures. Through a partnership with AgCentral Farmers Co-Op in Maryville, the community is invited to come alongside and help. Individuals, businesses or other organizations can purchase posts in honor or in memory of someone. The co-op will sell them for $8.19 each. Plaques will be placed on the posts for those who purchase them. The fencing will need to be in place soon, Henry said. She will be receiving four horses, two that will stay at Mane Support and two that will be donated to a therapeutic center in Morristown. Any of the 10 horses that don’t sell will also be kept here. The date for the horses to arrive is Jan. 19, 2018. The horses being donated are gypsy vanners, Henry explained. It is a domestic horse that originally came from the British Isles. The gypsy vanner is known for its sweet disposition. The breed is strong but mild-mannered enough to be with children. Henry has one gypsy vanner at Mane Support now. She has used Hopeful Cherokee Gold in her work with first responders who worked during the horrific and deadly wildfires in Gatlinburg last year. The fencing, rubber mats and horses are part of what is being called the Barton Legacy Project, Henry said. The funding will assist Mane Support in obtaining more staff and increasing structures here in Blount County. All of Mane Support’s programs will also be aided by this gift, Henry said. Programs include Supporting Our Schools, Horses Helping Heroes, Changing Reins, HOPE, which stands for Horses Offering Peer Encouragement for teens, internship opportunities and also individual, group and family equine assisted grief counseling services. Clients of all ages work through their grief of losing someone they know, other trauma or post traumatic stress disorder. The goal is to also implement the Mane Support Model training for other facilities nationally and to implement a partnership with Ridin’ High in Morristown. That would allow Mane Support to extend its reach from Morristown to Pigeon Forge and Gatliburg to White Pine and Johnson City. MANE Support is licensed through EAGALA, Equine Assisted Growth and Learning Association. The grief counseling is done on the ground instead of on horseback. Henry and Barton met back in 2013 when Henry took part in the Leading by the Reins Leadership Program which Barton oversees with his Peak Technical Institute. In addition to the campaign to purchase posts for the pastures at Mane Support, there is also another way this community can get involved. Henry will hold work days on Jan. 12-15, 2018 before the horses arrive. Anyone who would like to help is welcome. Henry said that could include school groups, churches, Scouts or businesses and individuals. Barton said he is proud to be able to help Mane Support with its mission of serving others. He said this donation of horses is being done though the Gypsy Gift program. Barton and LexLin have donated horses whose total worth is over $1.1 million. Barton is the largest breeder of Gypsy Vanner horses in North America. He has imported more than 500 of the horses. 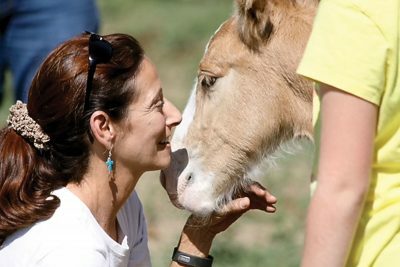 And while he has donated more than 65 horses to centers across the U.S., Mane Support is the first center Barton has donated to that does its counseling with clients who stay on the ground and don’t ride. “We are proud, happy and honored to be a part of this with Mane Support,” Barton said.